The GBC is a compact trailed 1-row top lifting harvester with bunker that is equipped with the latest technologies. Compared to its big brother, the GBI, the GBC has a more compact bunker and a shorter wheelbase. The smaller dimensions and a cylinder mounted on the drawbar make the GBC exceptionally manoeuvrable. With this arrangement the steered wheels guarantee perfect positioning of the machine, even on the smallest parcels. 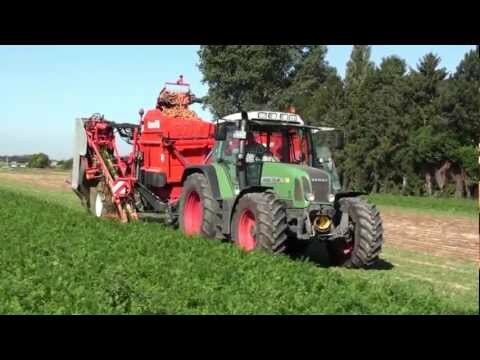 The root crop is suspended uniformly and accurately in the 10,500 mm long super grip profile harvesting belts. The ‘Floating Share’ is a unique feature: one harvesting element with independent harvesting share, whereby maximum stability is guaranteed, even at high driving speeds. The top lifting harvesters produced by Dewulf are made with high-quality, wear-resistant standard components. The bearings of each cutters set is hermetically sealed using ‘Labyrinth Sealing’. This provides the highest degree of durability available on the market. Each cutters set is driven by a maintenance-free ‘Gearbox Drive’: two heavy-duty pinions ensure perfect synchronisation of the knives. Ease of working means quick working. Working with the trailed top lifting harvester is extremely enjoyable thanks to a control-unit and joystick. Using the control-unit, it is possible to view and adjust all settings. An optional camera system makes it possible to optimally follow the entire product flow.